This Chinese Horoscope is predicted for all Chinese zodiac signs. Choose the one you belong to. Based on the principles of ancient Chinese Astrology, the forecast we make here provides you an insight that would help you tread the path of success and prosperity. If you apply in your life what you get to know from here, you would be able to balance Yin and Yang along with the ability to attract abundance. In ancient China, those who knew the secrets of life using planetary movements were able to fulfill their desires and achieve a calm state of mind. The Chinese Horoscope given here shows a path that leads to worldly achievements as well as to inner peace. According to Chinese Astrology, there are 12 Chinese zodiac signs–Rat, Ox, Tiger, Rabbit, Dragon, Snake, Horse, Sheep, Monkey, Rooster, Dog, and Pig–and every individual belongs to one of these animal signs. The ancient seers of China recognized that every year belongs to a corresponding cosmic animal energy. If one finds and understands this phenomenon, one can use that time according to universal laws and get peace, prosperity, and success in all spheres of life. The same is true about other units of time i.e. day, week, and month–if you know which energy is governing that period, the resistance with the cosmos can be lowered and optimum can be achieved. Astrologically speaking, you can reduce your problems and increase the flow of positive energy in life, if you do not cling to things and situations, and keep your focus on the feeling of let-go. Also, you may balance the energies inside and outside to grow in the direction you want to. 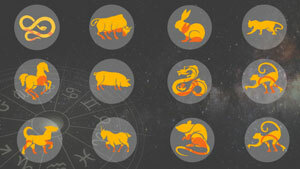 Check out our Chinese Horoscope to understand how you can attract luck and find your true self.